The history of the people that have inhabited Palestine can be seen in the large variety of pottery designs found throughout the region. Some discoveries date back 5000 years. During the Roman period, pottery made in Palestine reached new highs. 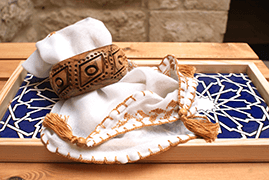 Palestinian artisans had a reputation of the most skilled craftsmen in the region. They could replicate any styles from throughout the Mediterranean area, no matter how delicate and elaborate. Simple fired clay pottery was an essential part of peoples’ daily life before and during biblical times. Common pieces included kitchen utensils, lamps, pitchers, buttons, and even toys and games. Broken fragments of pottery were even used as writing implements. Durable fired clay pottery was indispensable for storage due to its amazing quality to keep contents nearly watertight and prevent decay and corrosion. For example, numerous parchments of the Dead Sea Scrolls were found sealed in huge clay jars that had kept them safe for almost 2,000 years. Recently immigrant Armenian artisans specializing in the production of fine painted ceramic tiles and pottery, introduced their own version of this craft to Palestine. Colorful patterns and clean, simple designs of hand blown glass and pottery have a charm that evokes its Phoenician origins. Traditional Bedouin and peasant rugs are weaved by a manual wooden machine, called the noul, using hand-spun and dyed yarns of indigenous Awassi sheep wool. Designs based on local folkloric motifs and ornaments still exist in some Palestinian villages. Some of the oldest, family-run factories still operate in Gaza, although thematic custom-designed and machine produced rugs are becoming popular among the local population.